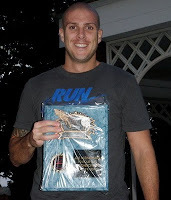 On Saturday Michael Ryan completed the Joe Kleinerman 12 Hour Run in Queens New York. The goal in this endurance run was to log as many miles as possible around a 1709 yard loop within a 12 hour period. Michael completed 64 laps of the course logging 100K (62.2 miles) in 11 hours 53 minutes for 6th place overall.